Our annual Children’s Day is a fantastic way to introduce your children to the exciting world of horse racing at its best. 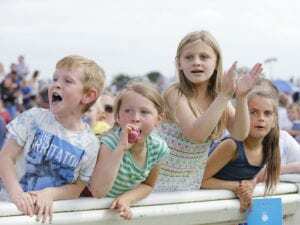 Not only do we have thrilling racing, on our Children’s Day we have lots of FREE activities to make the children’s experience of Ripon Races even more enjoyable. Here at Ripon we believe that horse racing is a sport that should be enjoyed by all the family, we offer FREE admission into all enclosures to all children under 18 as long as they are accompanied by an adult. We also have two permanent playgrounds available at each meeting, located in our Course and Paddock enclosures to keep the children entertained. There are lots of lovely options for something to eat whilst here with us and also welcome picnics in our Paddock & Course Enclosures. There are catering outlets in the course enclosure (which is where the majority of our children’s entertainment is based) and over in the Paddock & Club enclosures we have a wide variety of options including jacket potatoes, home cooked warm dinners in our Fountains Café along with Fish ‘n’ Chips and hot roast sandwiches & toasties. And for afters, we have the wonderful ‘Charlotte’s Ice Creams’ and our traditional sweet shop on site. If you would like a sit down meal, we have our Club Restaurant in the Club Enclosure where children are more than welcome. Our caterers are more than happy to offer them a children’s version of what is on the day’s ‘A La Carte’ menu.